Today we would like to present to you a really exculsive giveaway. AlMubdi and GraphicDesignJunction have teamed up to offer you to 12 exclusive web templates & 25 logo templates worth $315 along with their PSD source file and at the buyer’s own choice under one year subscription out of a wide collection of over 450 copyright templates. As the world is moving speedily these days, the technology is getting updated every single moment and new entrepreneurs are entering into the world of business along with the requirement of creative designs, logos, etc. 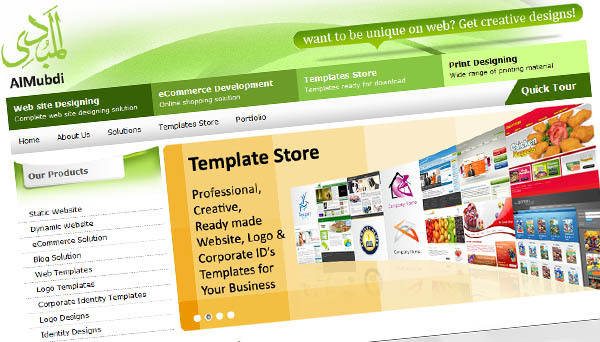 AlMubdi keeps its templates collection always updated as per current requirement of business persons. A single web template at AlMubdi’s store costs $20 and a logo template costs $5, by winning a collection of creative bundle, the user can save a huge amount of about $315 and download templates any time with his own choice and no time restriction within a year. AlMubdi offers its designing and web development services by which the entrepreneur can launch his business on the internet and so charmingly that the customer in just a single vision gets attracted and takes the ultimate decision to select that particular supplier among all its rivals. AlMubdi takes care of its customers and makes their products’ image look so unique that the unknown buyer with any identified need chooses AlMubdi’s customer from every angle for his satisfaction. You need to leave a comment on this post telling us why you would like to win. This giveaway ends on Friday, April 27th 2012 after which the comments section on this post will be closed. Please leave a valid email address so that we can contact you. The winners will be selected randomly as always. Winners will be announced on a separate post so i advise you to subscribe to our RSS feed and follow us on Twitter or on our Facebook page. Comments are moderated on this site and your comment may not show up right away. If any comments that do not follow the instructions on how to participate (described above) may not be published, or may be removed later on. Its Great for every one.